Bryan Lee O’Malley has crushed the hopes and dreams of all the authors hoping to claim the #1 spot on my Best of 2014 list. SECONDS is brilliant, the best thing I’ve read this year, and will deservedly find a place in my Top 10 of All Time. But I appreciated the innovativeness of the storytelling, and the artwork, though simplistic, was delightfully emotive. So despite not falling into the “O’Malley Adoration Camp”, I have been looking forward to his next, and purposefully avoided details of it, hoping to delve into it without context or foreshadowing. O’Malley’s new standalone graphic novel SECONDS plays with the concept of changing the past and future through magic. It’s not a new idea; we’ve read umpteen stories before that have explored this, and the consequences of such power – but never like SECONDS, which exudes artistic vitality and nuanced narration and dialogue. It’s a parable of sorts; an exploration of entering into adulthood and living with the choices we make, and oftentimes the regrets that follow. It arrives at the perfect time in my life; 26 going on 27, having just moved to New York and separated from family and friends – in ten years, when I look back and am asked to mark the point in my lifespan when ‘true’ adulthood arrived, 2014 will likely be it. Thanks to SECONDS, I’ll have something else to remember the year by in decades to come. Our protagonist, Katie, is 29, and a chef at a successful restaurant with plans to open her own. Like most almost-thirty-year-olds, she has a ton of regrets; relationship troubles, doubts over the chosen location for her restaurant, an imprudent fling with a colleague which leads to an accident. The latter in particular, which opens SECONDS, begins Katie’s downward spiral; suddenly it feels like every decision she made is the wrong one. Her life, imperfect though it was, as degraded from ‘fine’ to ‘terrible.’ If only she had a second chance, an opportunity to rectify things, to make the other choice, and wander down an alternate path. A mysterious girl appears in the middle of the night with instructions on how Katie can change things, and erase the bad decisions she’s made: “Write your mistake / Ingest one mushroom / Go to sleep / Wake anew.” And it works. But Katie becomes consumed with her power to change things, and she begins erasing even the most trivial occurrences of her life, hoping to mould her life into something close to perfection – but of course, it’s not quite as simple as that, and very quickly Katie’s destiny is no longer in her hands; there’s a darker force at play. While there are supernatural elements in SECONDS, it’s essentially a character piece. Katie has hopes and dreams and is conscious of the divergent paths each of her decisions takes her down. She is already haunted by choices she’s made, and her neurosis of manipulating time and ‘redoing’ supposed misguided decisions is fuelled by her fear of failure. It makes you wonder: if you had the opportunity to amend one major decision in your life, what would you choose? Then suppose you suddenly discovered you could amend more than one – where would you stop? Would you stop at all? Katie oversteps, and the consequences are personally devastating. O’Malley’s storytelling has improved since SCOTT PILGRIM – not just artistically, but his writing too. In SECONDS, the writer / artist has refined the rawer elements of his earlier work; there are fewer pop culture references, and while these characters are larger than life, they’re undeniably human. Aided by an artistic team which includes the vibrant work of colorist Nathan Fairbain, SECONDS is an incredible visual package. 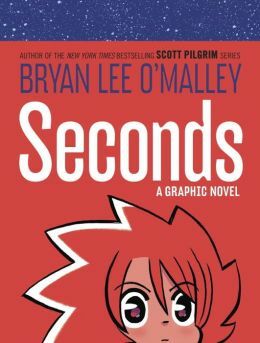 Bryan Lee O’Malley has reached an unprecedented zenith with SECONDS; and with surely more to come from this insanely talented comics creator, I’m excited for what the future holds. SCOTT PILGRIM fans will be all over this already; but those like me, who perhaps didn’t feel the same awe for that series, should definitely check it out. There’s no finer graphic novel currently in stores. Now, excuse me. I’ve owned SECONDS for less than 24 hours, and I’m about to enjoy it again for the third time. Am I smitten? You betcha.